Episode one of Guardians of the Galaxy from TellTale games is out, here are my thoughts on it. From Earth to the Milano to Knowhere and beyond, and set to the beat of awesome music, this five-part episodic series puts you in the rocket-powered boots of Star-Lord in an original Guardians adventure. 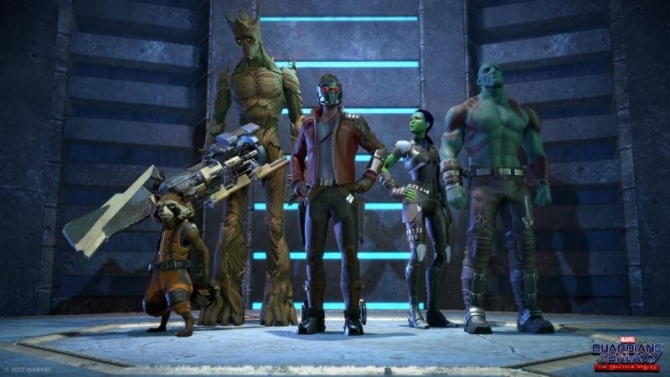 Guardians of the Galaxy is a series from TellTale games. It’s a story driven game fueled by your choices. This is episode 1, “Tangled Up in Blue”. Let’s get into the review. Here’s the setup, I don’t like giving away spoilers to games, but let’s just say that you have just killed someone big and you have a choice who to give the body to. Depending on your choices different scenes play out. For example, I took the credit for killing someone and rocket raccoon got up and left muttering how mad he was at me. He didn’t even want to talk to me when we got back to the ship. Also, there are quicktime events, some that actually matter. You can be fighting and prompts will appear on screen prompting you to press W for up and A for left. They did a good job with the button presses syncing to what happens on screen. Sometimes even if you don’t press anything the characters do their actions anyways which was a shame, BUT that doesn’t hold true for everything, sometimes if nothing is pressed, nothing happens on screen either, so that’s a step in the right direction. There are points where you take control of Peter (Starlord), and you have to figure out what happened in a scene piece by piece. Hitting the control key will scan the area and a short segment consisting of holograms will play out the scene. I was in an area where I saw a soldier get shot, I then scanned further and I saw that he landed further down the building and dropped an ID key which I needed. Pretty cool stuff. The graphics are pretty damn good, everything has a stylized look to it, and is very detailed. Telltale is really stepping up in this area. The voice acting is excellent, everyone did a great job and a lot of individual personalities shine through. The music is just okay excluding the title screen song, it does the job but it’s forgettable. All said, I enjoyed this episode and look forward to playing episode 2. The graphics, opening song, quicktime events that actually responded to buttons being pressed. Soundtrack was forgettable, the story wasn’t too exciting. PREVIOUS POST Previous post: My Persona 5 thoughts, 10 hours in. NEXT POST Next post: Video Game Journalism, Content Update, Slacking, and an upcoming revamp!